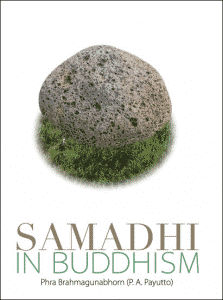 Samadhi in Buddhism is a free ebook on the concepts of Samadhi, the state of a steadfast mind. Samadhi becomes an important art to master for everyone who wishes to take meditation to a deeper level. Well developed Samadhi equals strong concentration which is an importent skill to have whena working on various forms of meditation. At the same time Samadhi is a characteristic useful for other activities such as sports, studies, work and other occupations where a one-pointed mind is purposeful. E-book on the Buddhist concepts of Samadhi, the state of a steadfast mind.